Starting Mammograms at age 40 saves lives, but The United States Preventive Services Task Force (USPSTF) recommends starting mammograms at age 50. 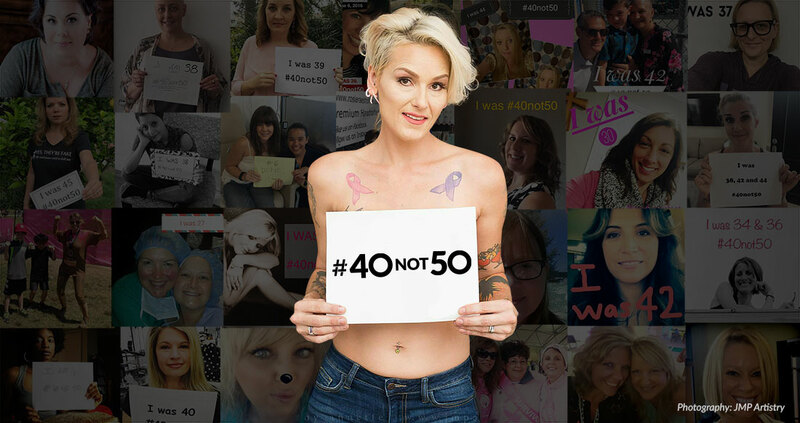 Join Our 40 Not 50 Campaign. With your help we can help countless women and give them a fighting chance to detect breast cancer when curable. Don't believe the "Scientific Studies" that conclude 22% of breast cancers will disappear without treatment. Miller A.B., Wall C., Baines C. et. al. "Twenty Five Year Follow-up for Breast Cancer Incidence and Mortality of the Canadian National Breast Screening Study: Randomized Screening Trial," British Medical J 348(February 2014): g366. Listen to women's stories with breast cancer diagnosed before the age of 50. Join us in our campaign to ensure all women start screening at age 40! © 2019 40NOT50 | All rights reserved. Unauthorized use is strictly prohibited.